I received the book on Tuesday and thought I would just look through it, but could not put it down and read it from cover to cover in one sitting. Having only been in Melbourne for 16 months, it was so reassuring to hear all those other comments and realise all the emotions we go through are typical of most expats. Thanks for a great read and please keep us informed of any other work that you do. I'm really enjoying the book...I think it's really well put together and very well written! I like the cover design and Everything!! Well done to both of you...it even succeeded in making me homesick.... and the quote..."if the pull of Africa is not enough to bring you home, then maybe you don't belong anymore"...well, that was like an arrow straight through the heart. I just wanted to say thanks for such a great book - really inspiring and helpful to know that as I make my big move across the pond I might have the chance of hearing the odd SA accent in the Big Apple! Although I think my chances of finding biltong could be a bit more difficult!! 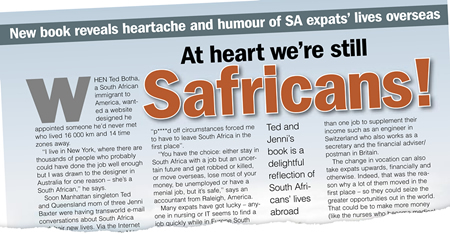 I still live contentedly in South Africa, and never considered reading 'The Expat Confessions' because I didn't think it concerned me. But what a wonderful surprise. I picked it up at a friend's house and couldn't put it down. There was just so much in it that I could relate to - just about being a South African, and celebrating that South African-ness in all of us, whether we're a mom or a dad, a daughter or a son; and whether we live locally or overseas.